Tommy Chong took to Reddit today because someone, once again, spread a rumor that he was dead...and a lot of morons believed it. It's called a Death Hoax, people. The questions fans asked were pretty basic. Here are things we've never heard before. On what it was like working with Martin Scorsese on the film After Hours. "One memory is that they had me drive the van recklessly but they didn't tell me where to finish. And so when I careened around the corner there were a bunch of Japanese tourists that had come to watch the shoot right in my pathway... I stopped just inches from them. The look on their faces though, they were taking tourist photos. I learned I'm a pretty good stunt driver that day." "I was once with Robert Plant and I drove a Citroen at the time and he told me "You drive the nicest car in the world, Tommy"
In 1984, Cheech Marin and Tommy Chong present a Special Achievement Award to Richard Edlund, Dennis Muren, Ken Ralston and Phil Tippett for the Visual Effects of Return of the Jedi at the 56th Academy Awards. Hosted by Johnny Carson. Tommy Chong's daughter, Rae Dawn, tweeted an update today on her dad, who had surgery in October to remove a cancerous tumor. She says he's "feeling frisky, golfing and going out to functions..."
Tommy Chong's daughter, Rae Dawn Chong, tweeted today that her dad is feeling better and stronger. She thanked everyone for the good vibes. In October, Tommy underwent surgery to remove a cancerous tumor. 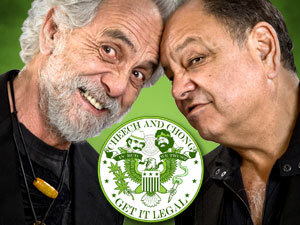 Cheech and Chong canceled a number of tour dates, but just recently rescheduled a Reno date for February. Tickets go on sale this Wednesday via the ticket link above. My Dad is feeling better...stronger. Thanks for all of the good vibes and love. Much appreciated.